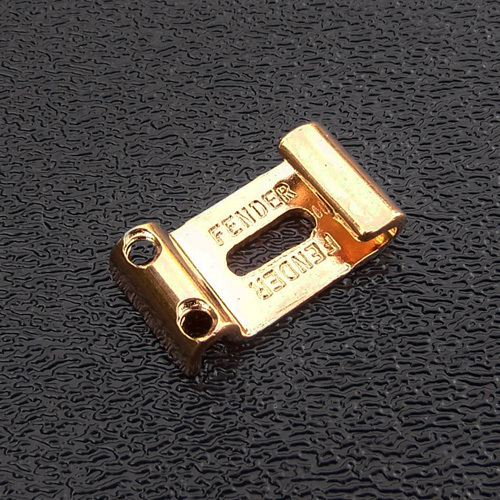 Fender® original "FENDER" stamped individual Gold Plated bridge section for American Vintage Stratocaster®. This is a bare bridge saddle, does not include height adjustment set screws, intonation screw or intonation spring. Accepts #4-40 saddle height screws and #4-40 intonation screws. For vintage American Stratocaster® bridges with 2-7/32" E to E spacing. Each saddle is approximately 0.435" in width. Not for use with the narrower string spacing bridges of the American Standard or Mexican Strat.